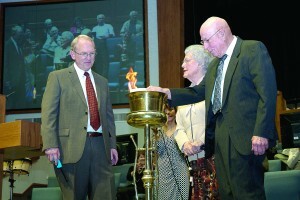 Mavis Koonce and Lucien Adams, right, assist Bethany, First Pastor Charles Womack with the note-burning ceremony. BETHANY—On Sun., March 3, members of Bethany, First united in celebration as they burned the note with the Baptist Foundation of Oklahoma, officially canceling the remaining debt on their worship center. The “United in Victory” campaign raised more than $600,000 for the project, which complemented an existing education building constructed in the 1970s. Ground was broken on the new worship center on March 9, 2003. “It was the final payment on our Worship Center,” said pastor Charles Womack, who pointed out the service also involved the church’s Hispanic fellowship, Iglesia Bautista Fuente De Vida. Assisting the pastor with the note burning ceremony were two special people, he said. “They included Mavis Koonce, widow of Matt Koonce, who was the pastor of the church from July 1980 through February 1990,” Womack said. “It was his vision for the church to build a new sanctuary where we eventually erected the building. 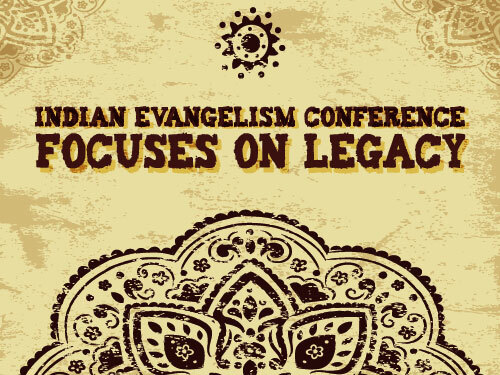 Womack said the generosity of a couple in the church paved the way for the debt retirement. Bethany, First was organized in 1945. It is located at 3800 N. Mueller Ave.